Here are a couple BIF samples with the D610. The first is not a magazine shot, I know. But, it was a looooong shot and heavily-cropped, and on a completely overcast day. In fact, it started raining shortly after this shot. It was taken with the regular (but my semi-beloved) 70-300 VR. A better lens and a better photographer may have provided better results. The second was with the same D610 and 70-300, but much better conditions. Good light, and closer range. I'm sure the D750 is better, but is the D610 good enough??? Wow! How much crop? I'm back and forth on the 750 and 610 myself. I like the high ISO performance of the 750, but I always try and keep it 800 or under anyway, if I can. So mostly a moot point. Obviously the 610 can track. 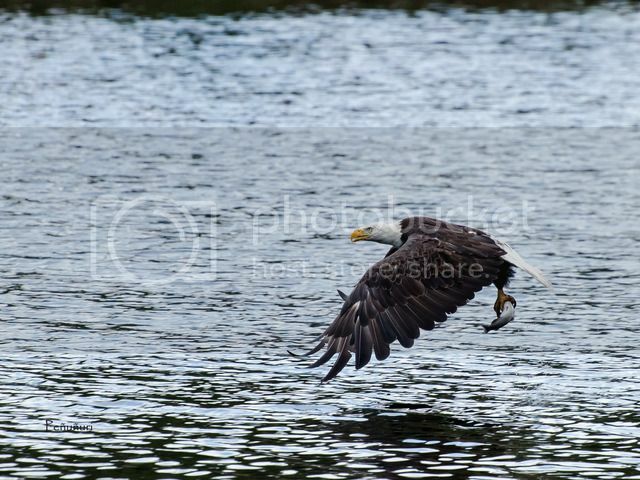 Below is the eagle image out of the camera and before the big crop. After shooting with the D750 for a while now, what really gives it the nod over the D610 is how it auto-focuses in the dark. I shot a couple of outdoor weddings at sunset, and both cameras hummed right along. But with my light stands set up for post-ceremony group shots and the sun down to the point that the view finder barely makes out black silhouettes of people, the D610 AF did finally raise the white flag, and the D750 kept right on going. The 'Group' option within the D750's AF system is really nice too, and seems to work better for me when I stop down and go for birds in flight or shoot sports. And yes, it does handle high ISOs a little better too. If you say you never go above ISO 800 and you rarely shoot in extremely dark conditions, I would be tempted to save some money and go D610. IQ will be identical. If cash doesn't matter, the D750 is one sweet rig for sure. I love the deeper grip too. Happy to hear you were able to spring for the D750. I think there's an AI-S version of the 135 f/2 that might save you some money if you don't might manual focusing. I can't imagine the weight difference between 5d3, d750, 6d, d600/610, etc., being significant. I still own 5d2, 5d3, d750, and have played with d800/d810 and the pro bodies. To me, weight isn't an issue until I consider the pro bodies (or some battery grip, which I also don't ever use). Then weight becomes an issue, because the difference is big and I can no longer comfortably hold the camera with a single hand. Besides body style, lenses are the other thing that affects weight. I use the D750 for weddings now. However, I am not a huge fan of the D750's body design. I like the autofocus tracking overall (3d mode mostly), and IMO it's far ahead of the 5d2/5d3/etc., but the AF fails me sometimes by giving false locks in low light (though that can be improved somewhat by waiting longer for focus acquisition in AF-C). I like that it has a tilting screen, but it's the first screen that's ever broken for me in all my years of dSLRs. I like that it has dual card slots, but it would be nice if they were CF for speed purposes. I don't like the mode switching/etc. button ergo or the lack of a good, fast scroll wheel for menus like Canon bodies have. I dislike how loud the shutter clack is and how it seems more prone to generating camera shake blur from the shutter than any other camera I've used. The 5d3 was light years ahead with the silent shutter mode, same for the D810. Live view behaves differently between systems, and I'd say the D750 is better at locking focus in live view but moving the selected focus area is really annoying. The buffer is too small, worse with dual card writing. The reason I went to the D750 from the 5d3 was because the 5d3 gave me terrible focus results in low light and the shadow recovery was always a watercolor chroma noise mess. Those things are much better with the D750 for me, but honestly I'm just waiting for Canon to release a better sensor and AF system in another 5d design and I'll go right back to Canon. I've been shooting modestly-priced weddings since about 2008. The 1DX II would be perfect for your needs. But it may be too expensive, although a lot of wedding photographers are shooting with them. Hopefully Canon will incorporate the low light and autofocus improvements from the 1dX II into the 5D IV. Long had the D750 now though and its a stunning bit of kit. do people not really read these threads before responding? I just used the 610 and 750 at a corporate event. I wanted 2 750s, but they only had one. IQ is very similar, but there is something wonky with the white balance on the 610. All my 750 images came out with a nice white balance, whereas I needed to tweak the white balance in the 610 in lightroom a lot more. I shot both in auto white balance.